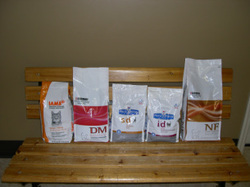 Your pet's health can be directly related to the nutrition they receive. Maintaining good body condition will help keep at bay many problems such as diabetes and certain joint injuries. If your pet ever needs special food due to a medical concern such as Obesity, Kidney disease or Diabetes we stock and have access to many veterinary diets. Please contact us if you have any questions regarding your pets eating habits. Never begin a weight loss or exercise program without speaking with your pets doctor.